There are no rooms available at Shutters for these dates. Parking: There is no on street parking available. Parking is available nearby at a charge of £7.50 per day. Groups: Groups are accepted up to a maximum of 5 people. No stag and hen groups. Jenny and Chris are outstanding with their communication, in fact it feels like I have known them for years even from the first point of contact. We have stayed in their beautiful cottage for the last 3 years, the cottage is so well equipped it has everything you can think of even a basket for personal care in case you have forgotten to pack them. The cottage is in a fantastic location just foot steps away from the harbour beach, I wouldn't want to stay anywhere else. Our favourite local pub is The Sloop, especially when Bob Love is singing! The best fish and chips we have found is The Balancing Eel. Beautiful cottage in a great location, we loved our first stay here! Owners super helpful, cottage has EVERYTHING you might need. A lot of thought has been put into the furnishings and decoration and it's all lovely. Great to see local art work on the walls too. Thanks for a lovely stay! 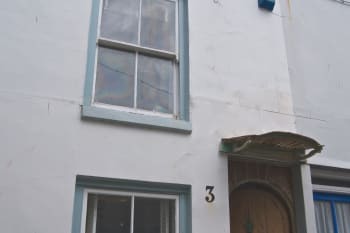 Minutes from The St. Ives School of Painting, the Tate, a stone’s throw from the beaches, and in the middle of the higgeldy-piggeldy charm of St. Ives. “Perfectly perfect” A quiet little cottage with everything you could need inside. The attention to detail in the property and from the owners is excellent. Fantastic fun character cottage! Perfect location seconds from 3 beaches and old st ives town - but lovely and quite too. Renovated and decorated with real flair retaining original character features. 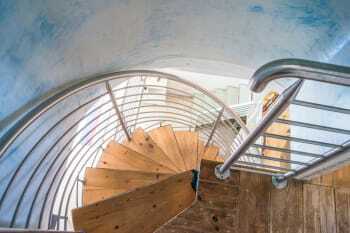 Spiral staircase was cool. 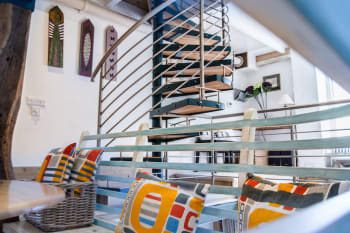 Everything you need for a wonderful break _ board games, beach toys, picnic basket, stereo, deck chairs, beautiful well stocked kitchen and dining area. Hosts friendly and responsive. Shutters is the best!! Lovely quirky features all over the house. Location is brilliant, so close to beaches, harbour, everything in fact! We were only 2 but the fact that both bedrooms are ensuite is a real plus point if friends are travelling together. In my opinion Jenny and Chris have thought of everything to make a stay at Shutters perfect, with any questions answered really quickly. 100% recommend!!! This is a wonderful apartment which is well located close to the harbour, beaches and all amenities. It is fully stocked with everything you will need for preparing meals, which is great. The beds are very comfortable. There is a car park close by, (Island Park) if you can get a spot. Don’t follow google maps to get to it as it takes you all through the town unnecessarily- with some very narrow streets and sharp turns. Follow Wharf Rd and then left on Fish St as the best route. The owners were good communicators and responded quickly. We very highly recommend this charming rental. You won’t be disappointed. We are so pleased you enjoyed your stay in our house! Good tip on the way to the car park too. Perfect holiday property!!! Very close to beaches, shopping & restaurants. Lovely second stay at Shutters. Nice new refurbed ensuite in the back bedroom since last year. Always a pleasure to stay here. Great location, easy comms with owners and nice (full!) Xmas stockings on the beds, which was a lovely gesture. A great little pre Xmas break, so thank you so much for letting us have your lovely home. Thanks for your lovely review. It's always a pleasure having you stay for your Pre-Christmas treat and I'm glad you like the new ensuite. Really enjoyed staying at The Shutters. It is very comfortable this adds to a relaxing stay. 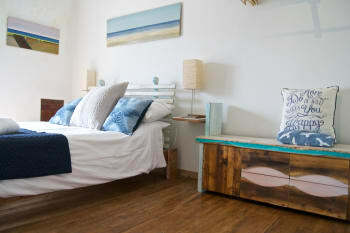 Its in a great location and the perfect place to explore St Ives. Beautiful spacious house, certainly big enough for two couples. The service I received from Jenny throughout the booking was great and super helpful. The house has everything you would need and the location was the best bit! Beautiful house very close to all the beaches of St Ives. The house was extremely well equipped with everything we needed for our holiday. Would definitely like to come back again ! 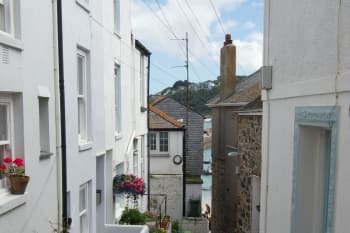 We have been visiting St Ives for 17 years and we have stayed in many properties. This year we have had the pleasure of spending two weeks in the fantastic property, that is Shutters. The location is perfect for beaches, shops and eating out. The decor of the house is quirky and really accommodates a family especially teenagers who need their space! 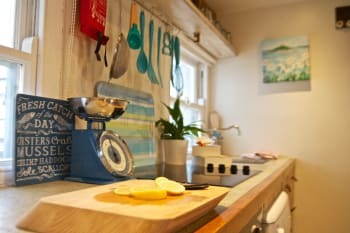 I truly loved the kitchen and it's location in the house and the wet room was a god send to store surfboards and wetsuits and shower straight from the beach. Jake our dog really loved the house and settled very quickly. I have to say the owners replied within hours via email about any query and gave 100% customer satisfaction. Thank you for our cream tea - it was yummy! Shutters is a lovely cottage with all the amenities you would need. The location is perfect just a few steps down to the harbour front and a 5 minute walk to Porthgwidden Beach. It was very clean and well presented and the owners had even left us a cream tea and fresh milk which was a lovely added touch. I cannot fault anything, it was the perfect place for our family especially as we could also take our family dog. Thank you for your lovely review. We are so pleased you liked Shutters and had a great time - and you're welcome to borrow our piece of heaven whenever you come back! Nice quiet central place to stay perfect with a dog close to the island were you are able to walk all year round. We thought it was a very sociable layout and quirky décor. It was great having multiple bathrooms. Only yards to the harbour and town, very conveniently located. The Tate and the Barbara Hepworth Garden always worth a visit. The Art House Gallery on Back Street East had some wonderful art and helpful staff. The Balancing Eel and the Food Room on the Digey are both excellent. Kids love Pels - good take-out food, reasonable prices and delicious crepes. We've had Sunday lunch at the Union and the Sloop - both good. Olive tearooms - wow the cakes! Breakfast at Porthgwidden was lovely (as was lunch!). Porthmeor Beach restaurant for tapas or just a bottle of wine gazing out at the surfers. But our most favourite place in the world is Portminster beach cafe - pasties, chips, paninis, coffees, ice-creams, Korevs, jugs of Pimms - all while fighting off the seagulls - nothing better! What a fantastic quirky house. Beautifully designed, really really clever in every tiny detail. We loved it, great location, easy access to beaches a few steps away and also the Island Car Park for parking. Very comfortable in every way and really cosy at night. We come to St Ives every year for pre Xmas break and would definitely come here again. Just loved it. St Ives packed full of places to eat but a highlight was hot chocolate and great cakes in the outdoor concrete cabins with heaters and padded seats watching dozens of surfers at Porthmeor Beach Cafe. We also love Porthminster Beach Cafe, not cheap but great food (though we thought not as good as previous years) and also Porthgwidden Beach cafe too - need to book really as very small and window seats desirable. We also love The Digey Cafe, possibly the best carrot cake in the world. We went to Ghost Stories in the Dark at the tiny Boathouse Theatre literally 10 steps from the house. Great unusual charming and very well done evening! Barbara Hepworth Museum a must, if you have never been. Had a lovely holiday in st Ives, house great, the sofa bed not very long . Lots of lovely places to eat, the hidden kitchen was one of the best, in peak times it is better to book as turning up on the evening and getting a table anywhere is impossible. Shutters is a fantastically located and beautifully renovated house, full of character, with everything you need and more. It is extremely well equipped, with no expense spared on the decor and lovely attention to detail. We stayed for 5 nights and found it immensely convenient, comfortable and reasonably priced for such a good quality holiday cottage. We wouldn't hesitate to recommend it. The owners, Jenny & Chris made the booking process and access simple, with excellent communication. There are some quality independent arts and craft galleries/people in St Ives that make beautiful things. The Blue Bramble Gallery, Island Sq is a great example. The Leach Pottery is worth a visit and has beautiful ceramics to buy. The Porthmeor Beach Cafe does lovely breakfasts & amazing scones. Harbour Fish & Chips exceeded our expectations as did Blas Burger, The Mex and The Seafood Cafe. A one to one at the St Ives Surf School on Porthmeor got a positive review from my partner. Fantastic place, beautifully laid out and had everything we needed. Nothing felt like too much bother. Child friendly too which was brilliant. Will definitely return.